When I was growing up, many years ago, times were simpler. As a child, I was taught the difference between right and wrong and when I failed to acknowledge this difference, or chose to violate my parents teachings, punishment was sure and swift. I did not always do the right thing but I always knew what the consequences of my actions would be. To reinforce the teachings of my parents I also watched all the westerns on TV and viewed many western movies at the local theater. I learned two things, that the good guys always win in the end, and the good guys always wore white hats. In todays culture it seems as if a lot of that has become blurry. People do not seem to be teaching their children right from wrong and they do not teach them to expect consequences for their actions. As a child I was taught that a police officer is one of the good guys. I was taught that a police officer was the one person that I could trust and the one person I could depend on if I were lost, in trouble, or hurt. I still believe this to be true to this day. However, it does not seem as if today’s youths are being taught these valuable lessons. In fact, for some years now, I would have to say just the opposite is true . Some years back, when I was a young police officer, I was spending some time interacting with a small group of young African-American children between the ages of eight and ten. The children were curious and were asking me most of the usual questions and we were all having a good time, enjoying the interaction. Suddenly, a mother of one of the children came outside and yelled at her son to “get away from the bad policeman”. I should clarify that I did not know this woman and there was no reason that she would consider me as bad, other than my profession. I can only hope that the lesson she taught her son, and the rest of the children, did not stick with them as long as the memory of the incident has stuck with me. Because if so, that notion implanted in his brain could have, some day, caused that person to so distrust the police that he would not follow orders and would reach for a gun instead. That last was a segue into the most recent use of deadly force by police officers in Cincinnati, Ohio. There has been a lot of discussion by ill-informed people about the use of force by the officers and their right to use the force. The use of force of any kind by a Cincinnati Police Officer is highly regulated and well documented in the Cincinnati Police Departments “Use of Force” procedure. Additionally, there is more regulation and documentation when it comes to the use of deadly force with a gun, as documented in the Police Department’s “Discharge of Firearms by Police Personnel” procedure. A Police Officer must be aware of all the requirements of these documents and must adjust his or her actions to be in line with these requirements. All of this must be part of the decision to shoot or not shoot and the decision must be made in a split second, all the while being vigilant for the safety of other officers and citizens in the vicinity of the occurrence. These documents are taken very seriously and a police officer is held to each tenet within those documents. No use of force, and particularly deadly force, is ever taken lightly by the Police Department. Use of deadly force is documented in every detail and analyzed and held up to scrutiny by the Homicide Unit, the Professional Standards Section, the Police Chief, the Civilian Complaint Authority, and the Hamilton County Prosecutor’s office. All of this is done to make sure the integrity of all actions of all members of the Police Department. If deadly force is use, and is deemed proper by all the investigations, then one should feel confident that the use of force was appropriate and necessary. Now comes along a group who call themselves “Anonymous”. This is a group of cowardly little piss ants who, for some reason, think that the information presented by the media is enough to make them an authority on the subject and better able to render a decision on the appropriateness of the actions of the highly trained police officers, then all the other aforementioned groups. A police officer, when dispatched to a man with a gun, must go towards, and not away from, danger. The police officer faces the man with a gun, tries to verbally deescalate the situation and when, and only when, it becomes clear to the officer that it has become a matter of self-defense or defense of another will the officer resort to deadly force. All of this takes a great deal of courage and heroism on the part of the officer. By contrast, a member of Anonymous, who was not on the scene, did not face the threat of death, and has not been trained, or probably has no knowledge of the previously mentioned procedures, seems to know better. One of these gutless individuals will stand behind a podium, hidden behind a mask with its voice electronically altered, and give a judgment on the actions of the police officer. I ask you, what takes more courage, facing a man with a gun or hiding behind a mask, while making a speech, not in public, and not in front of people, but in a YouTube video? Police Officers are human. Police officers, like every other human, sometimes make mistakes. A police officer might make mistakes that could cost them their livelihood, their freedom, or even their lives. But by and large, almost all of the time, a police officers actions are honest, admirable, honorable, courageous, and heroic. Police officers are still the persons that I trust and the ones I can depend on if I am lost, in trouble, or hurt. Police Officers are the good guys. 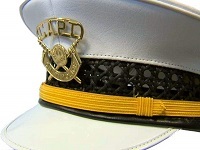 Police Officers wear the white hats. This material may be republished, broadcast, or redistributed. In fact, I encourage it. Excellent post! To me, though the members of Anonymous may have their hearts in the right place, they are doing more harm than good. They get in the way of, and foul up investigations. They judge without all the information, as you pointed out. The members of anonymous should make themselves available to help out using their skills and take the masks off. In my Deputy Deb days…the late 70s, I experience the LEARNED HATE OF COPS that is on steroids today. I stopped at a North College Hill “5 & Dime” type store (now gone) to buy a greeting card. I was in full HCSO uniform. To my horror, a little boy (around 5 yrs old ) jumped out from around the card rack, in a crouched position…and SHOT ME with his “finger” gun. His mother did not correct him. I walked towards him and said nicely, “Oh, you don’t want to do that to me–I LOVE YOU!” He ran to his Mom and they rushed out the door. The shop owner witnessed this … and just shook his head. HATE was LEARNED! One of the best ideas to counteract this thinking…is School Resource Officers where kids see the “goodness” of Cops … away from the (negative) influence of their parents. In every community Mike and I visit across the Country, we encourage local Patrol Officers to STOP IN SCHOOLS (instead of gas stations, fire houses, etc) … to use the rest room and grab a (usually free) cup of coffee from the teacher’s lounge and cafeteria…to just mingle with kids (“Just Say Hi!) in an unstructured, unscheduled way, to show LEO’s human side. The added bonus of “LEO Drop-In’s” is the FREE unpredictable security for the school system! FEEDBACK on this idea is terrific, however … believe it or not, we’ve heard from a few departments … that a few administrators don’t want patrol officer’s doing this….because they don’t want the perceived negative assumption … that a police car in the lot = trouble at school. Well…then it’s time for a PTA meeting and a GOOD NEWS newspaper article…explaining this concept! Cops VS (negative) Citizens is an EDUCATION PROBLEM. It will never be eradicated but it can be greatly improved if we stay positive, clever and motivated to improve Peace on Earth (locally). What other choice is there? Tom, Very well written and SPOT ON! Thank You for taking the time to share it, Respectfully, Joe Hall.